A pastry cutter, also known as a pastry blender or dough blender, is used to work solid fats like butter, shortening, or lard into flour to create a dough. If you're making pie crust, biscuits or some other baked good that calls for this tool and you don't have one, there are several things you can use instead. Cut the butter (or whatever fat you're using) into small pieces. Add it to the bowl with your flour and other dry ingredients. 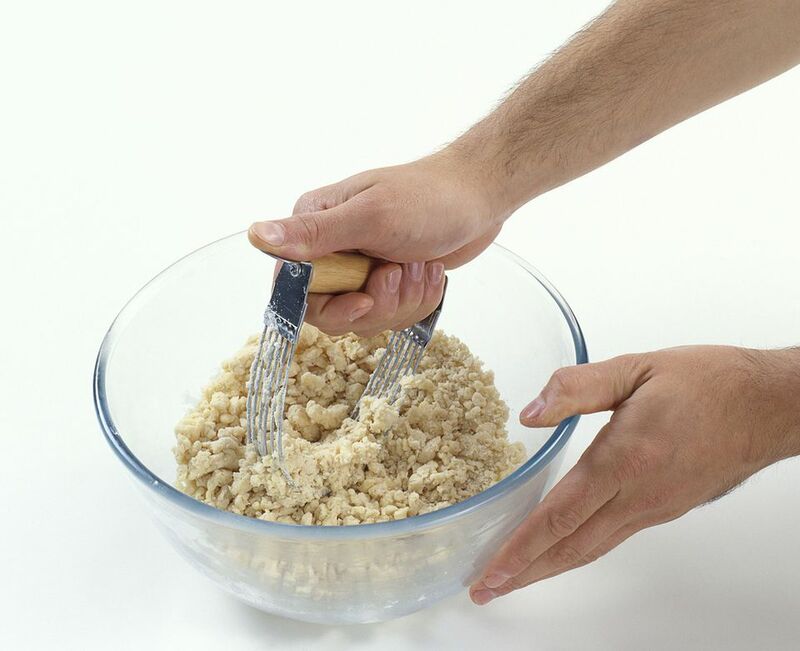 Then, use a fork to mash the butter into the flour, until you achieve a crumbly consistency. Hold a knife in each hand, and work both knives over the ingredients in the bowl, until the butter and dry ingredients are well combined. Pulse the butter and dry ingredients in your food processor until you achieve a nice, crumbly texture. It won't take long, so be careful not to overwork your ingredients. Work the butter into the flour with your hands. Just squeeze the ingredients between your fingers to break up the butter and bring everything together. Use cold hands and try work quickly, so the butter doesn't melt. Grate the butter with a box grater, then mix it into the dry ingredients. Use cold butter, so it grates easily. You even can use frozen butter. When a recipe calls for the use of a pastry cutter, it's because the butter or whatever fat is called for is supposed to be cut into tiny pieces and distributed throughout the dry ingredients rather than incorporated into them. If you cut the butter in properly, you'll end up with a crumbly texture, rather than a uniform texture. That crumbly texture is important because it'll give you the flaky baked goods you're after. Whether you're using a pastry cutter or one of the stand-ins, you need to ensure the butter doesn't melt into the flour while you're working with it because that'll wreck the crumbly texture. Use cold butter, and try not to work the ingredients more than necessary, so the butter remains in solid form. A tip for keeping the butter cold is to wear latex-free gloves or other gloves appropriate for food preparation. This will allow you to handle the butter a bit longer before it starts to melt from your body heat. If you do a lot of baking, a pastry cutter may be a worthwhile addition to your collection of kitchen gadgets. It's a u-shaped hand-held tool, with a series of dull blades or wires at the bottom, and a handle at the top. It's designed specifically for cutting solid fats into flour. Since it covers a bigger surface area than a fork or two knives, it makes quick work of the job, and it's a lot less messy than using your hands. If you decide to buy one, opt for a model with blades rather than wires. It'll be a lot sturdier. And go with stainless steel. It won't rust, so one pastry cutter should last you a lifetime.